The charged material particles are hypothesized to be formed from stationary waves of ether. The electric charges are determined by the surfaces of the particles and the density of ether. 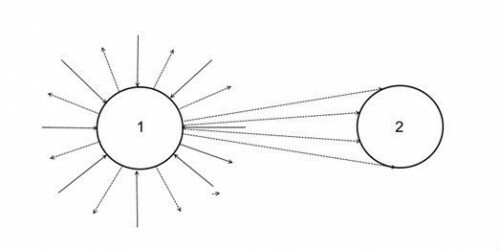 This theory explains the Stern and Gerlach and Young'slits experiments and gives the missing hidden variables of the quantum mechanics. Ether is hypothesized to be constituted of vibrating corpuscles, circulating isotropically with the speed of light and to be at the origin of the charged material particles by formation of stationary waves.The electric charges are defined by the surfaces of the particles and the density of ether, which is determined by the electric force between two particles.The ether theory gives logical explanations of experiments such as those with Stern and Gerlach’s apparatus or Young’s slits, while those of quantum mechanics are counter-intuitive.The ether and charged particle characteristics are the missing hidden variables of the quantum mechanics.